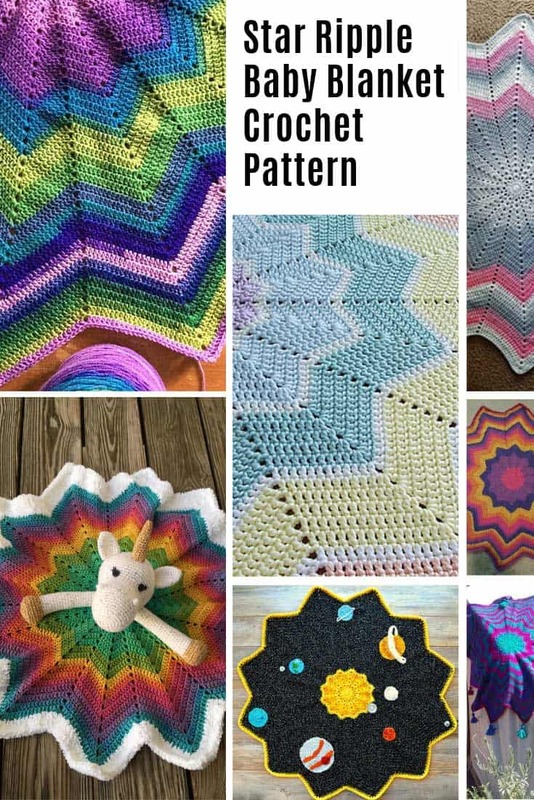 There are so many wonderful crochet baby blanket patterns available online that it can be hard to choose the one that you want to actually make. 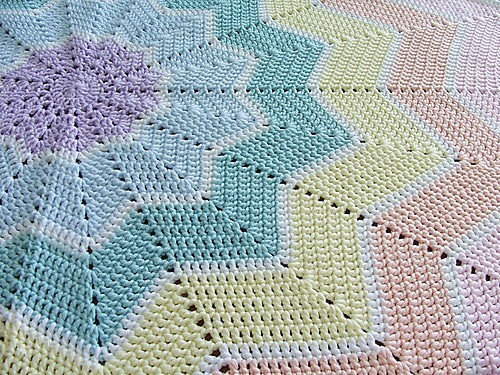 So when I saw this gorgeous 12 point star crochet blanket over on Ravelry I knew I had to tell you about it. 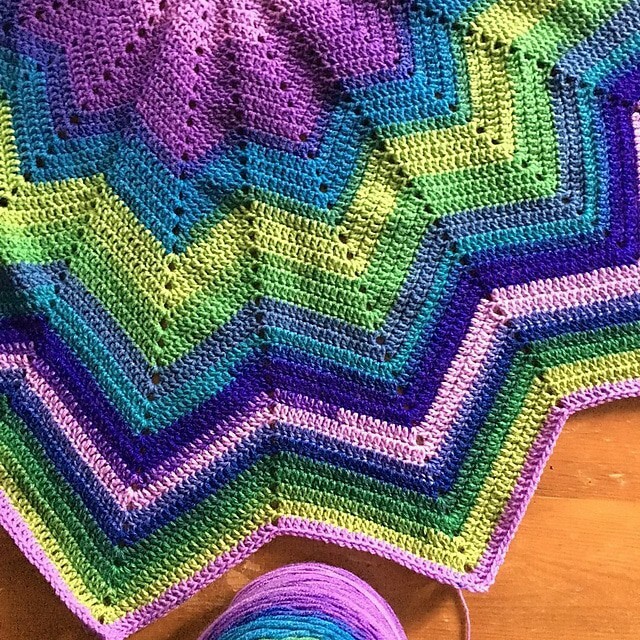 This rainbow ripple baby blanket is so popular it’s been made nearly 5,500 times in different colors, and using different yarns as people have made it truly their own. 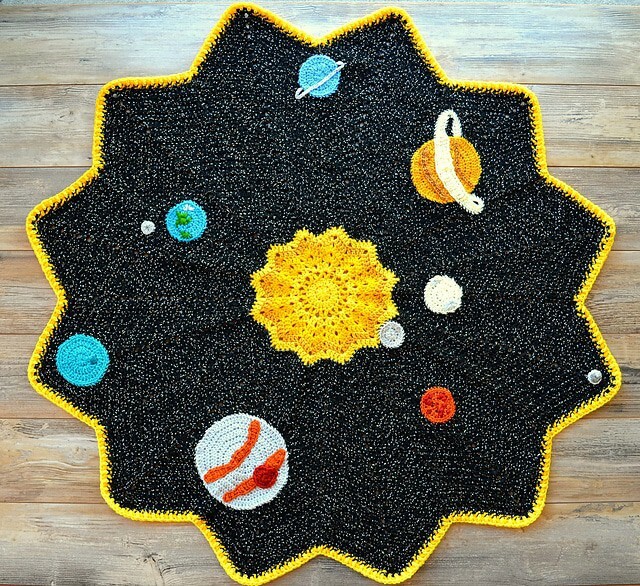 Some people have added pompoms, others tassels, and one talented Raveler even turned hers into a solar system blanket! 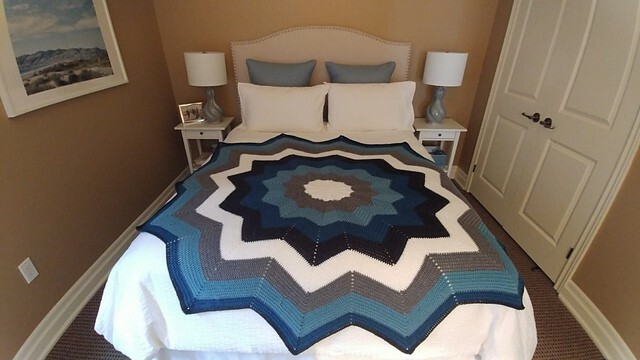 Oh and it might have been designed as a baby blanket but it’s been resized by happy crocheters to turn it into a lovey and a blanket big enough for a king sized bed! This free pattern is truly versatile so I’ve picked out my favourite variations to share with you today. 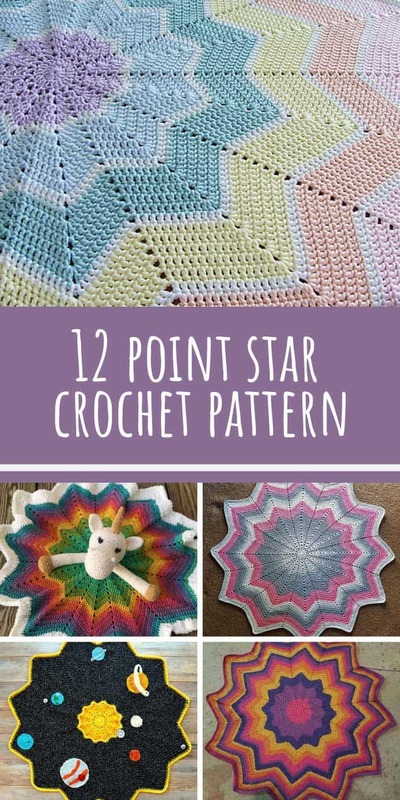 Be sure to scroll through and be inspired as to how you can make your own version of this super popular star blanket! This beautiful blanket was design by the very talented Celeste Young. 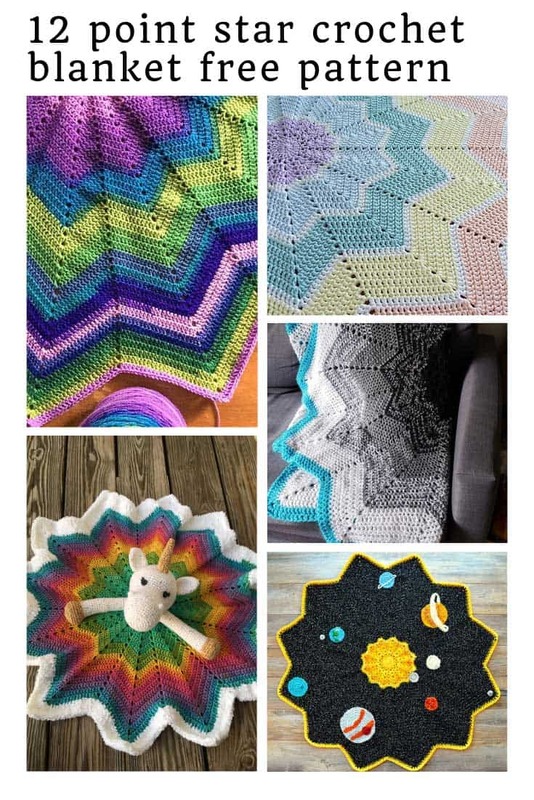 She says that while the formula for a round ripple blanket is nothing new she loves to use rainbow colors and add white stripes to create contrast. It’s her go-to pattern when she wants to make a handmade gift for babies and special kids, and it works up quickly too! The pattern is written in US crochet terms and is available as a free Ravelry download in English, Norwegian, German, Spanish and French. I’ve added my copy to my Ravelry library already and can’t wait to get started! 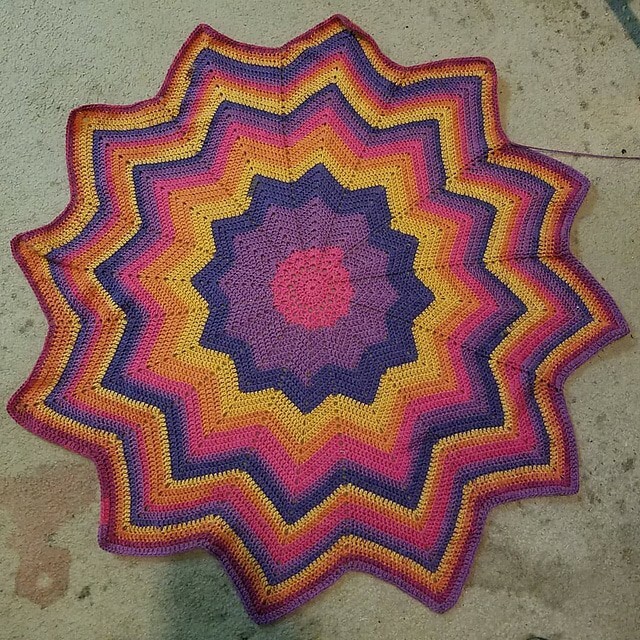 This is Jill’s 4th rainbow ripple blanket! Isn’t is beautiful? She used Red Heart Super Saver Solids yarn and has been working with two strands held double on a 10mm hooks. 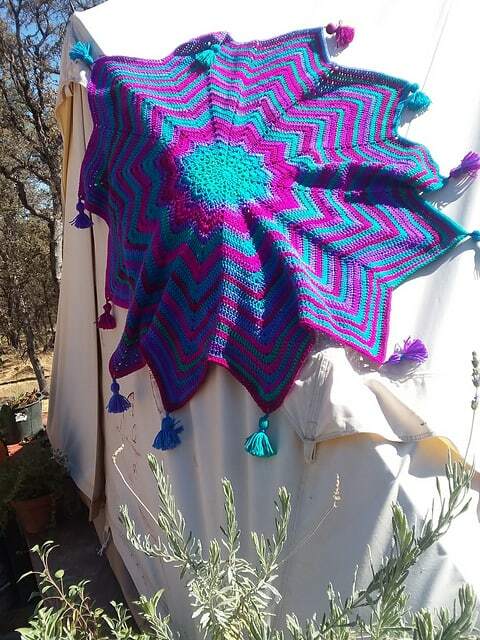 Adrianna made this blanket for her goddaughter using two skeins of Lion Brand Mandala. I love the colors, and because the yarn is self striping you don’t have to worry about switching yarns to change colors. Here’s another version of the blanket made using Lion Brand Mandala. This is a combination of 226 Peacock and 202 Mermaid Cove. Isn’t it GORGEOUS? So bright and vibrant! Katy made her version of the ripple blanket for her friend’s baby using Sirdar Snuggly Pattercake. She finished up with two rounds of double shells. 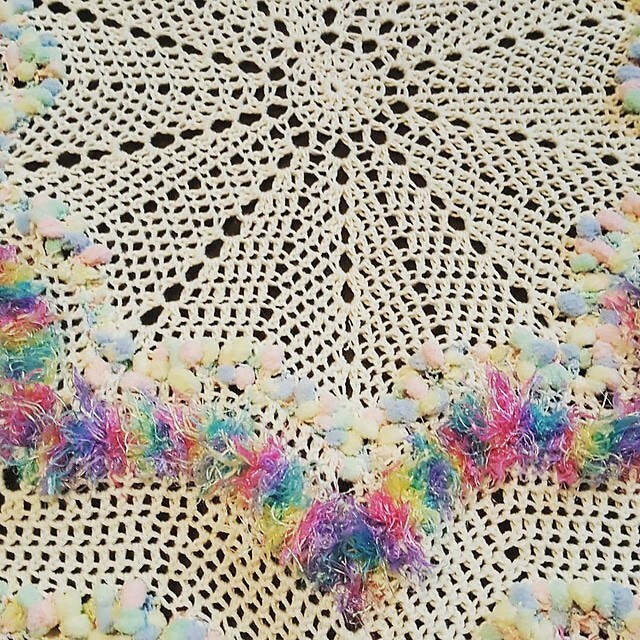 Lily used Caron Baby Cakes in Dreamy Sky to make her version of the blanket, and mixed things up by adding some cute pompoms to the corners! Remember how I said you didn’t have to make this blanket baby sized? Here’s how it looks on a full-sized bed, and it’s heavy and warm so perfect for the winter! 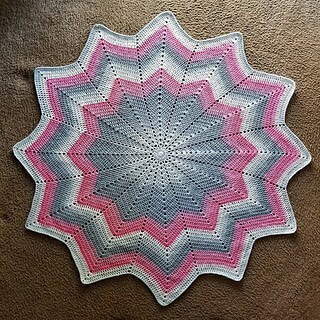 Caron Cakes really do make the perfect yarn choice for this 12 star blanket. Look how well this one turned out! So bright and colorful. I love the purples, and pinks against the yellow! Arlene added a personal touch to this popular pattern by adding tassels to each of the star points! Here’s a quick video tutorial in case you’ve never made yarn tassels before. 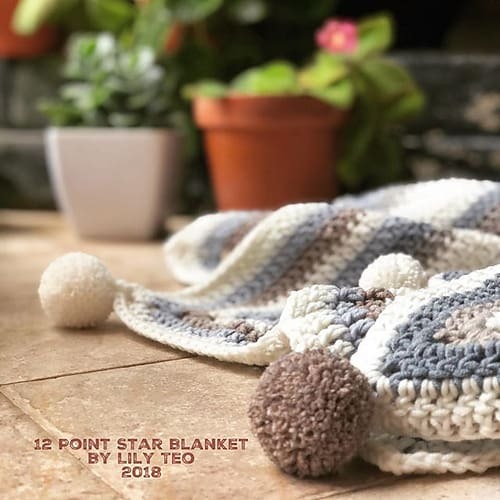 RJ really made this pattern her own using a bamboo cotton for the main blanket and then two feature yarns to add a pompom and fur style detail. Wow! Andi certainly knows how to combine two patterns to come up with something special! 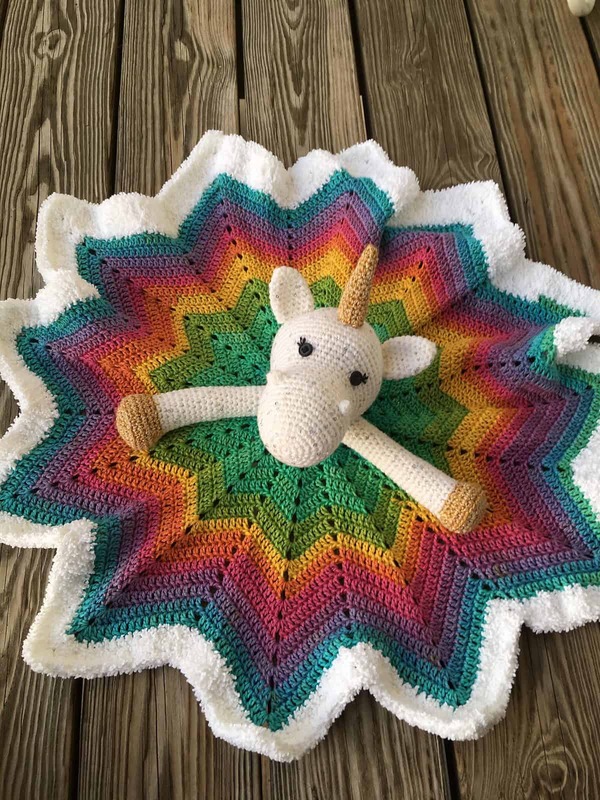 She used the popular rainbow ripple pattern to make this adorable lovey blanket combining it with the amigurumi unicorn head and legs from a YouTube tutorial! I think the lovey (and Andi) are amazing! 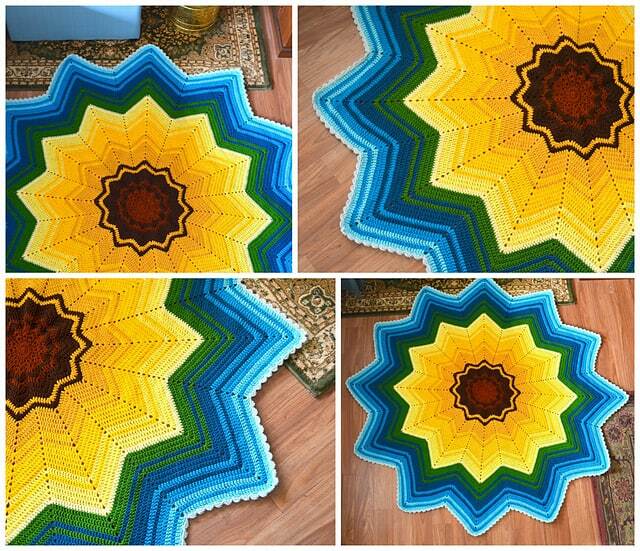 Courteney took the ripple blanket and turned it into a sunflower using her wonderful choice of bright yarn colors. 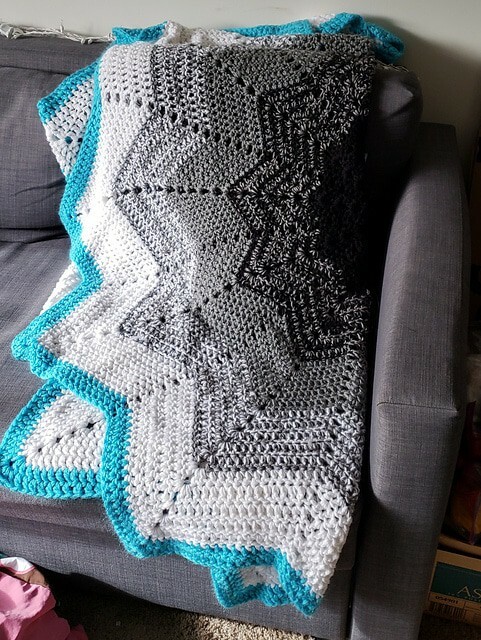 And this final variation of the 12 point star crochet blanket was also made by the super talented Courtney. It’s a representation of a the solar system for a little boy’s nursery and I think it’s out of this world! 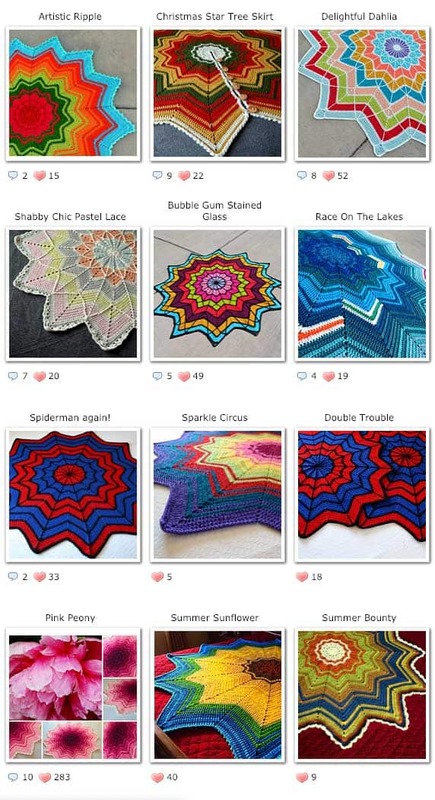 Courtney is a big fan of this ripple blanket pattern and has made it in 26 different variations. Here’s just a snapshot of them. See the Christmas Star Tree Skirt? So clever! 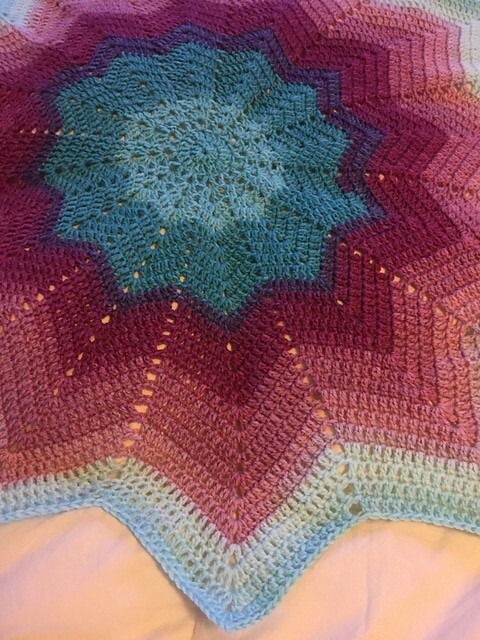 You can see all of her other completed ripple blanket projects here. Previous PostPrevious 37 Things to Do At Disney World that Don’t Require Theme Park Admission!